The extended family plays an important role in supporting access to home ownership. “Self-built housing” in the sense of autonomous production of housing by households, plays an important role in housing supply. The characteristics of the metropolitan area of ​​Athens -which in statistical terms is not substantially different from the Region (former Prefecture) of Attica- are fully consistent with the “Southern” model. Based on the table of the Annex to this document for 2008, a comparison between urban areas , of Western European countries (excluding the former “Eastern Bloc countries”), shows that southern countries and Greece in particular, present the highest rates of private home ownership and a very small percentage of houses with “subsidised rent”. They also reveal significant percentages of residences donated for free use – a clue as to the special role of family, in contrast to other western European countries. An equally important indication as to the role of the family is the extremely limited role of bank loans and, reversely, the high percentage of full ownership (free of mortgages). These phenomena should be added to the list above, as they are particularly evident in Italy and Greece. The urban area of ​​Athens covers almost the entire mainland of Attica and Salamina, while 99% of the permanent population of Attica resides within those limits. Even if we exclude some remote areas with relative operational autonomy and limited participation in the suburbanisation trends of the capital, (Municipalities of Lavrion, Oropos and Megara with some neighbouring communities), what could be considered as the Urban Agglomeration of Athens (UAA) in the narrow sense (Map 1) has 96.2% of the permanent population of the Region of Attica. 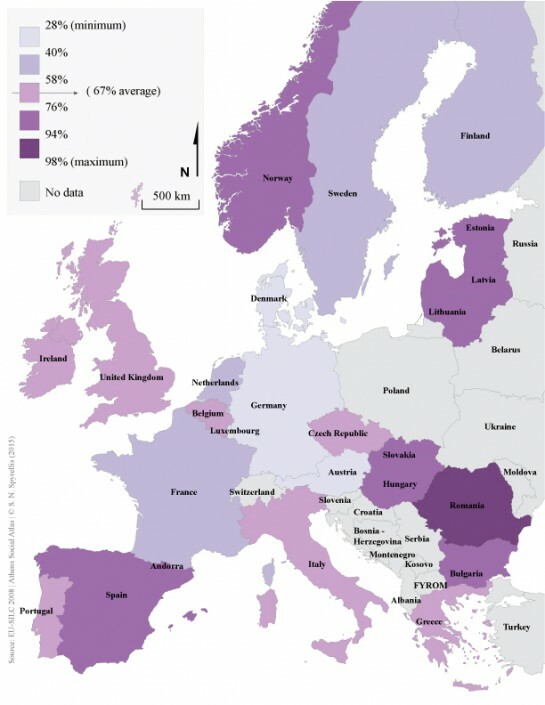 Across Attica, the rate of private dwelling ownership according to the 2011 Census was 68.4% -a slightly higher percentage than that of urban areas as a whole and definitely one of the highest in Western Europe . Based on data from family budget surveys (FBS) between 2004 and 2011, less than 20% of private dwellings in Athens had mortgages and housing debts, despite the surge of mortgages in the 1997-2007 period. On the contrary, a very high percentage of houses had been acquired through property transfers and/or significant financial contributions from the family. This percentage exceeded 50% in the 1980s (Emmanuel 1994), while in the 2013 survey, 38% of private dwellers reported that they obtained their residence from an inheritance, parental benefit or a flat-for-land barter of a family plot, while, in general, 47% stated that the family’s financial contribution to financing their house was high or “medium”. A major proportion of home-owners (55%) also lived in a building of one to five apartments (33.8% in a detached house or a duplex), which indicates the important role of self-promoted small-scale production in the accumulation of housing wealth, i.e. outside proper market production. The last point, which completes the comparison with the list of typical characteristics of the “Southern” model is that, in 2005, over 25% of households in Attica owned a second holiday home according to Household Budget Surveys (HBS 2004/05 data). In spite of economic growth and the great increase in the volume of mortgages in the 1997-2007 period, the rate of home ownership in Athens did not increase significantly compared to the 1980s data (Table 1). One reason for this was the influx of economic migrants after 1990, who lived almost in their entirety in rented homes and their home ownership rate approached 10% only in the last decade. Table 1 shows the percentages of home ownership for 2004 (in Attica) and 2013 (for the UAA), after subtracting households whose head is a national of the main countries that supplied the influx of economic migrants. It is obvious that between 1987 and 2013, the increase in home ownership rates for Greeks was no more than 5-6 percentage points. Given that, during the same period, the Greek population aged significantly, thus pushing home ownership rates higher, the limited changes in access to private housing are quite impressive and indicate that, essentially, the resources channelled to mortgages, replaced a significant part of the traditional role of savings by the extended family. It should also be taken into account that, since mortgages play a limited role in the Greek housing system, especially for younger age groups, a significant percentage of rental housing is necessary for as long as several households and the extended family supporting them are forced to save in order to acquire their own home. This is evident in Figure 1, which shows home ownership rates by age of the household’s head. A particularly important structural feature of the Southern European housing model, which is not indicated in relevant comparative studies, is that broad access to owner occupation transcends class boundaries. The prevailing view in comparative studies is that, since in southern countries social policy on residence is not widespread, nor is the development of mortgage lending, the opportunities for access to ownership vary depending on income inequality (see introduction in Kurz & Blossfeld, 2004). This is not the case in the south of Europe if we examine the large groups of income brackets used in the comparative analysis of Norris & Winston (2012). 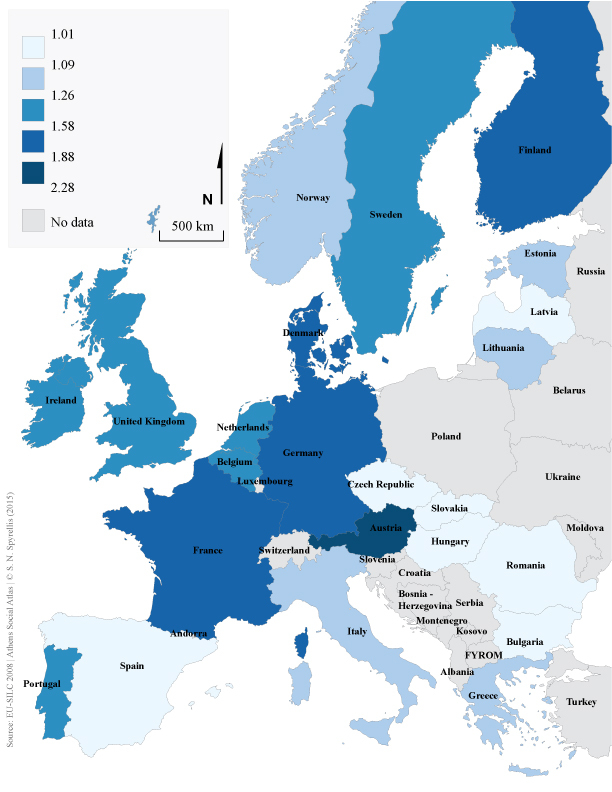 As shown in the Annex, for European countries, the higher professional category (Managers – Professionals) to manual workers (technicians-operators and unskilled workers) home ownership ratio is around 1.2 (with the exception of Eastern European countries) , while in Greece it stands at 1.15 (urban areas, 2008). In the case of Athens, this ratio stood at 1.40 from 2005 to 2013. However, the traditional Greek system of ‘open access’ to owner occupation was also very active in Athens in 1993/4, when the ratio was 1.11 (see Table 2). Class inequality with regard to access to home ownership became more visible in the following years due to the influx of foreign migrants, whose majority resides in rented houses. For the non-migrant population, the class distribution of access to home ownership remained stable. While home ownership rates for the non-migrant population are similar in three out of four professional categories in Table 2 – an average of 65% for households with economically active heads-, employees in sales and personal services have clearly lower rates . To some extent, this is due to the fact that these are relatively younger household heads. The main reason, however, has to do with the particular characteristics of this professional category. It is heavily influenced by the culture of small commercial capital, which usually avoids committing funds into real estate. (*): Households whose head is or has been active in the ISCO88 7,8 & 9 professional categories (Technicians, operators, unskilled workers). Source: SECSTACON survey, NCSR 2013, unpublished data. The ‘open’ access of lower professional strata to owner occupation in Athens explains the distribution of home ownership percentages in large geographic areas of the city (Map 1). Additional factors are the significant role of self-built housing in working class areas of the inner and outer suburbs, the inheritance of land and a housing stock that allowed further family use through additions, extensions or reconstructions. As shown in Table 3, the highest home ownership rates are to be found in sectors with the highest rates of working class households, in the western suburbs of the Athens basin and the western region (see also Map 1). Unfortunately, these geographical sectors also have higher unemployment rates following the economic crisis and the “internal devaluation” policies between 2010-2013- given that the unemployment of lower professional strata in Athens surged to 40% in 2013. Combined with the significant reduction in incomes and savings and the introduction of measures such as the abolition of the Workers’ Housing Organisation, social mortgage programmes and rent allowances, the reproduction of the traditional model of direct access to home ownership with the help of the family seems to no longer cover the necessary economic and social prerequisites (Emmanuel 2014). Comparisons of the economic characteristics of housing at country level are meaningless if rural areas are included, as effectively all the housing stock there comprises self-built owner occupied dwellings. In the Urban Agglomeration of Athens (UAA) this percentage is slightly lower – approximately 67.5%. The 2013 sampling survey of NCSR in the UAA (project SECSTACON [full title: Socioeconomic class, social position and consumption. Stratification, mobility and urban consumption in Athens] funded within the scope of the “EXCELLENCE-II” programme of GSRT) recorded a rate of 63.7%. Part of this discrepancy is due to the fact that free use of housing is proportionately higher (6.5% instead of 4.6% in 2011) probably for reasons related to the economic crisis (fear of taxation etc.). It is likely, however, that an error of 2-3% is also to be taken into account.